Boardwalks surrounding geothermal features should be replaced or moved because their placement and conditions are major factor in people misbehaving in the park. The boardwalks in the park have been in place for many years but need improvement to promote safety. There have been over 66 deaths related to geothermal features in the park’s history. Efforts are needed to prevent future deaths. Most incidents are caused by human nature and could be avoided if necessary changes were made. Yellowstone National Park was established in 1872. It is filled with some of the world’s most interesting natural geothermal features and wildlife. The park is home to two-thirds of the world’s geothermal features including over 10,000 geysers, hot pots, steam vents, and hot springs. Since the establishment of Yellowstone, the goal has been to preserve these geothermal features. Although in the 145 years the park has been open, preserving these sights is getting more difficult with new tourists and new problems arising with the changing of the times. Injuries among people and animals have always been an issue for all the years people have visited the park. One of the most recent deaths in the park was that of Colin Nathaniel Scott, a 23-year-old man from Portland, Oregon, who traveled to the park with his sister. The two went 225 yards off the boardwalk and then Scott fell into a hot spring, killing him. This is a reminder not to stray too far from the boardwalk and a sobering example of human error that moving the boardwalks further away from the geothermal features would help prevent. I recently visited the park myself this past April. I took observations and notes of the current boardwalks there. Almost every boardwalk I walked on was made out of wood, most of them were damaged by the weather and frequent visitor use. These boardwalks were breaking, bending, and falling in just by my passing on them. I only weigh about 140 pounds. Now imagine a buffalo weighing an average 1,400 pounds stepping on the same boardwalks that was bending by me walking on it. Not only is it people walking on the boardwalks, but the weather also plays a big part in the damage to these geothermal features. Sitting under snow for months at a time, the heat from the geysers, and whatever else Montana, Wyoming, and Idaho weather throws at them. But at the Old Faithful geyser, the boardwalks there were made out of an experimental recycled composite plastic. This material is both sturdier and eco-friendly, plus it wouldn’t have to be replaced as often as the wooden boardwalks. This new recycled material definitely would improve any geothermal features in the park. Human error would still occur but would help prevent people tripping or slipping on the wooden boardwalks currently in place. The material does cost more than wooden planks but last over 3 times as long. So, in the long run, the park would be saving itself money in the future. Plus maintenance on boardwalks wouldn’t have to be such a demand when you know the material will last. Some of the geothermal features in the park are more popular than others and the smaller areas would be fine with just wood. But others, like the Norris Geyser Basin, needs better material due to so many visitors at the particular spot. This basin is also located near the popular West and North gates. Funding for this project could also be achieved by raising the price of gate admission per vehicle. In the end preserving, both the geothermal features and animals the park is what the park is there for. By allowing visitors into the park, they also are liable for protecting those visitors. Replacing these boardwalks and possibly moving some that are too close is just two steps that park the National Park Service can take. 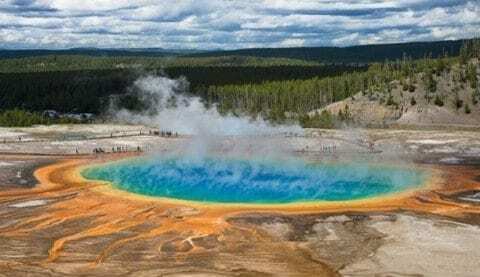 The Issue with Geothermal Features in Yellowstone National Park by Alexis is licensed under a Creative Commons Attribution-ShareAlike 4.0 International License. North Korea 's Nuclear Weapon: InfographicYellowstone's History is Surprisingly Unknown.